This past week there was a three day long Burn Notice marathon. After watching one episode, I was unable to tear myself away, and subsequently spent ** hours indulging in one episode after the next. I think what makes me like Burn Notice is that Michael, (the ex-spy, stuck in Miami and solving problems for the local color) is very smart. When I’m listing to his narration about how to wire a cell phone to become a bug or a remote detonator or how to trick the bad guys into thinking you’ve got something they need, I feel more than entertained, I feel satisfyingly educated. Another star accessory on many occasions is a brown leather waist bag, or if you prefer, fanny pack. I know, the name alone makes me shudder, and conjure up images of bright nylon bulging from a waist line. But the slightly worn leather bag on the impossibly thin Gabrielle Anwar, especially with the short white dress, I really kind of love. Best I can find to make it your own – this bag on Etsy for $70. So, for Fiona look on the cheap, Forever 21 is the place. Woven dress, 22.80 and oversized sunglasses, 5.80. Some really nice leather bangles can be found on Etsy for $24, or an even cheaper set with charms for $12 at Aldo. Throw in these copper bangles from Khols for $20. 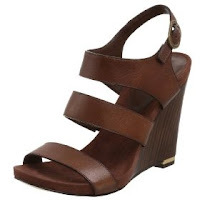 For shoes, why not try these 4 1/4 heels by Nine West. I love the vertically stacked heel with the dark brown leather.